Holistic Nutrition Hub has all the features you need to run a Professional Nutrition Business. 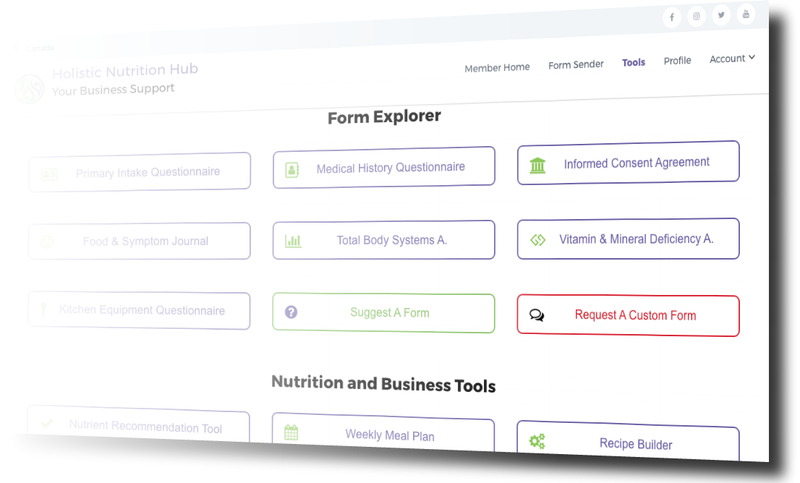 From nutrition assessment forms to our consulting tools, take a look at the features that make the Hub the best option for your Holistic Nutrition Practice. "I am SO excited that this hub exists, it has already saved me (and my clients!!) so much time to have the forms online! So easy, user-friendly and intuitive. I'm SO grateful as a fellow practitioner, and impressed with the service and attention to detail Sean and Lynne have displayed! I can't wait to see this thing expand and grow !! Thank you guys!!" Upload your company banner and business logo to easily personalize, customize, and brand your forms, meal plans and saved recipes. Save your client's results to PDF format for easy storage and analysis. Each consulting questionnaire can be saved as a PDF file directly to your computer. Your client's information can not be accessed or modified online. The results go straight to your inbox. Simply follow the security measures as if they were paper forms. Our forms do that for you! No more time waster adding numbers to find the answers you need, our system does all the heavy lifting for you and delivers clear results. Head to your profile page to add your client's contact information. Once saved, you can quickly pick what client to send from a drop-down menu in the form sender. Forget mobile-friendly: we made our platform and questionnaires Mobile Focused to provide you and your clients the best experience, wherever you are. All the nutrition assessment forms, consulting questionnaires, and features were built with one thing in mind: Simplicity of use. 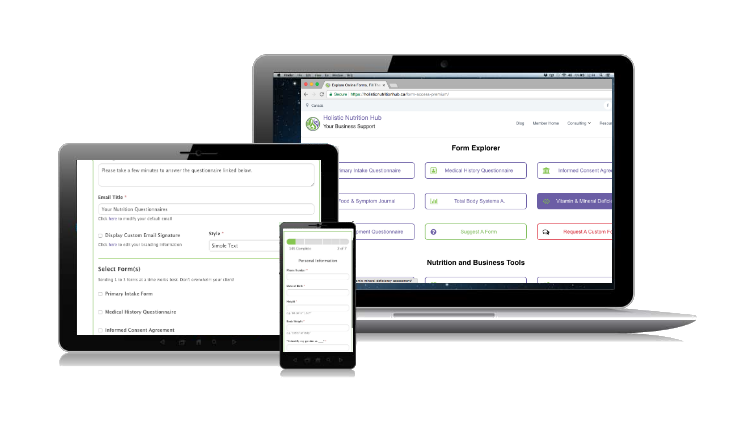 Easy to fill out on mobile, tablet, and desktop, you will provide your clients with the best user experience possible, no matter what.